It’s not all about the mattress. Get the perfect sleep solution with our range of sleep accessories. A unique ventilated, moulded gel-infused foam core wrapped in soft, exceptionally breathable Cotton TENCEL®. Created to deliver uncompromised head and neck support and the ultimate in temperature control. TENCEL®: Soft and naturally moisture wicking. TENCEL® is sustainably produced from the eucalyptus tree. Due to its moisture-wicking properties, TENCEL® helps manage temperature and keeps your bedding feeling fresher for longer. FusionGel® Foam: This foam combines the pressure relieving comfort of memory foam with the heat-absorbing support of advanced gel particles. It rapidly channels heat to help regulate your body temperature while sleeping. 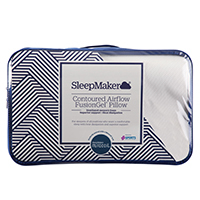 Classic or Contoured: Whether you sleep on your side, back or front, you’ll find a pillow in our range to suit your sleep profile. Rest your head on pure indulgence. 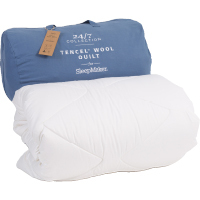 The luxuriously soft feel of TENCEL® and Cotton surrounds a Cashmere and Australian wool wrapped, temperature balancing gel-infused foam core offering exquisite levels of comfort support. Silk and Wool: A blend of fine, luxuriously soft fibres that help naturally regulate temperature while wicking away moisture for a comfortable sleep no matter the weather. 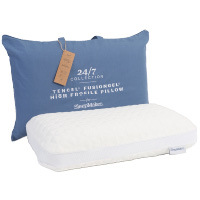 Contour shaped pillow for a comfortable sleep with superior support. Moulds & shapes to your head, neck & shoulders. Perfect for those looking for neck support & temperature control. Contour shape is suitable for sleepers of all positions, with versatile height options. 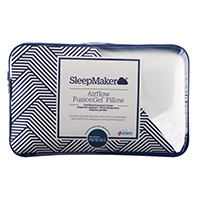 The SleepMaker Silk Touch Advanced Memory Foam pillow has been designed using technology and premium materials that work in harmony with a SleepMaker Cocoon mattress. 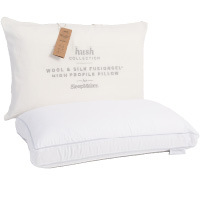 Classic shaped pillow for a comfortable sleep with superior support. Moulds & shapes to your head, neck & shoulders. Perfect for those looking for neck support & temperature control. Available in two profiles, Regular (for back & side sleepers) & Low (for tummy & back sleepers). Maintaining the right temperature in bed can be the difference between having a peaceful or disrupted sleep. The right quilt will keep you comfortable and warm. A premium Australian wool inner with a soft, sheer 300TC Cotton TENCEL® cover to help keep you cool in the summer and warm in the winter. Australian Wool: Locally sourced wool is a hollow-cored fibre that has natural insulating properties help maintain the ideal comfort temperature. When the air is cool and damp, wool naturally wicks away excess moisture, making it an ideal choice all year round. Wrap yourself in luxury. A sheer, yet soft TENCEL® and Cotton cover surrounding Australian Alpaca, an extremely delicate fibre that provides a soft and luxurious feel. Australian Alpaca: Soft, durable, luxurious and naturally silky Alpaca is hypoallergenic and provides exceptional warmth for its weight. 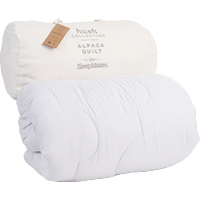 Alpaca naturally assists in temperature control, keeping your warm and dry in winter and cool in summer. 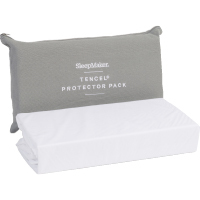 Sleep well and protect your mattress and pillows with this naturally breathable protector pack. TENCEL®: Soft and naturally moisture wicking TENCEL® is sustainably produced from fibres from the eucalyptus tree. Due to its moisture wicking properties TENCEL® helps manage temperature and helps keep your bedding feeling fresher longer. Waterproof and Breathable: An ultra-thin Polyurethane membrane blocks moisture but is still breathable. Made to Measure: Our protectors are made to fit all standard mattress sizes including those with a larger depth. 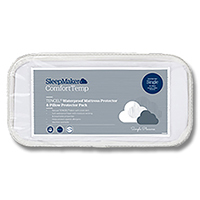 Stain-proof guarantee when used in conjunction with an eligible SleepMaker mattress. Protect your mattress and pillows with naturally breathable, waterproof protectors. Natural TENCEL® fabric offers moisture wicking properties and works in sync with your mattress and pillows. Machine washable. TENCEL® fabric with a polyurethane backing & a polyester jersey knit skirt.